Contents: Potato, peas, some sort of pudding, and your guess is as good as mine on the last item. I do know, however, that it isn't meat, as this is a vegetarian dish. Notes: I appologize for not posting recently, I've been busy hauling my family and I across the country, but we finally made it to Ohio. Looks like some sort of cauliflower and broccoli cheese dish, or other cheese and vegetable bake. thats actually a custard. british people love custards with pastries. Peas, Broccoli au gratin, potato. Ginger? Pudding (heavy sponge cake), custard. 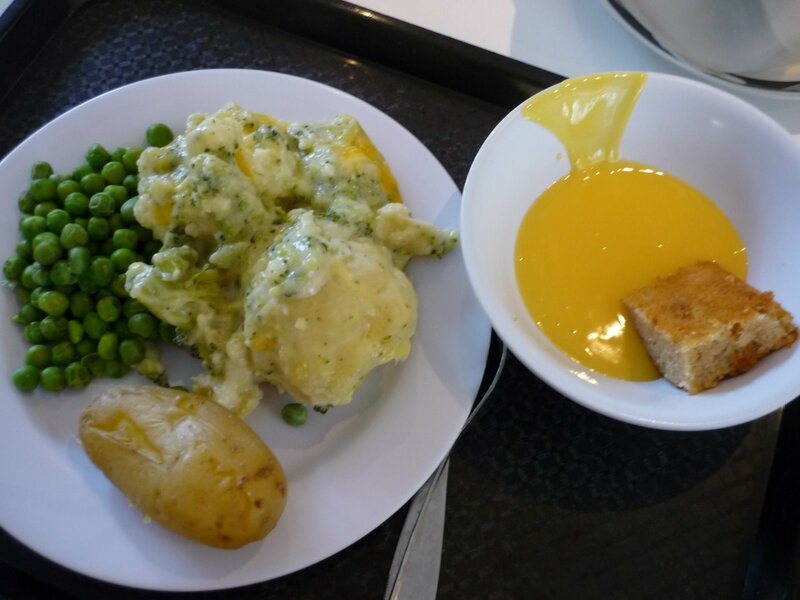 Nearly all UK lunches have "pudding and custard" as the desert.